Now I don't know if any of these cakes are "new" in general, but they are new too me. 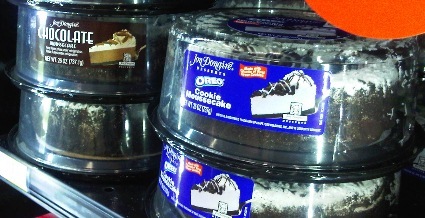 I haven't wandered over to the frozen cake freezer at Wal-mart in awhile, but I did Thursday night and boy was it hard not to grab one of these ultra tasty looking cakes. Ok, these two were REALLY hard to resist. Jon Donaire now offers up something they call moussecake, and as I learned as a small child, mousse is one of my very favorite words. Heck, I'm pretty sure I can remember the very first time I had chocolate mousse! in fact, I'm pretty sure I went back for seconds! (Oh I love dessert buffets). Sorry, getting sidetracked here. Ya got me, technically these aren't ice cream, but they are frozen, and they do look fantastic. I guess I would probably try the Chocolate Moussecake first, and then move on the Oreo Cookie Moussecake. Hmmm, I think I need to find Jon Donaire's marketing company and get all these wonderful looking treats up on the blog. unless i missed something, there was no purchasing and eating of the tasty looking food in this post. what's going on? i expect all cakes viewed and available to have been consumed, enjoyed, and reviewed in the near future. remember, christmas is coming up, and the usual laws of calorie intake don't apply on this magical day. that's why this day is celebrated in the first place.